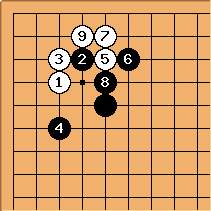 d: pseudo-joseki 6, White can choose a peaceful or a fighting variant. Andre Engels: Not much joseki is known for the 5-5 point, not only because it is played rarely, but also because common wisdom seems to be that a 5-5 point is better left alone than approached in most cases. 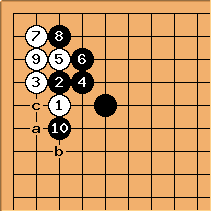 Here are some variations that have been played by professionals more than once, and thus might be considered proto-joseki. 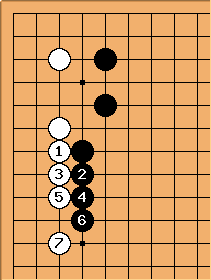 Actually just once this sequence, but I wanted it in because earlier moves in the sequence have been played more than once. 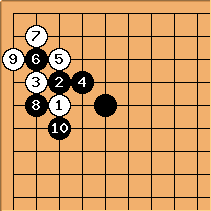 Chris Barnes, 2kyu? 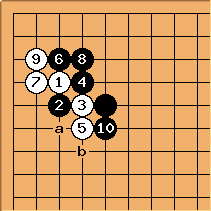 Back in the '90s, there was a rec.games.go newsgroup discussion that recommended a 3-3 invasion under the 5-5 stone. 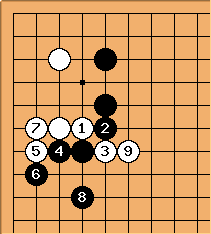 Has this move been seen in professional play? 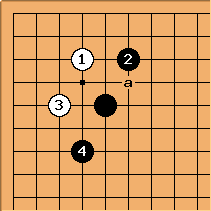 PJTraill: I do not know about professional play, butJosekipedia as of 2018-03-06 gives this, with a peaceful variant at a and a fighting variant at b as below. 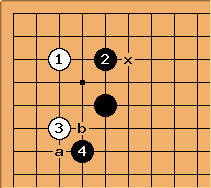 The comment on 3-3 is "Usually this invasion point is the best, because it makes Miai of the extensions and x (6-3 points)." 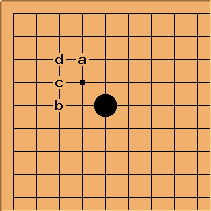 attributed to Alexandre Dinerchtein(3p - Korean-Style Insei League 13.11.2010).